If you are more like me, then you are running around trying to get everything done before the shops are completely stripped bare and you find yourself fighting in the isle with some other mad woman over the last bag of brussel sprouts. This is how this recipe has come about, I realised I hadn’t made gingerbread this Christmas and what is Christmas without gingerbread? 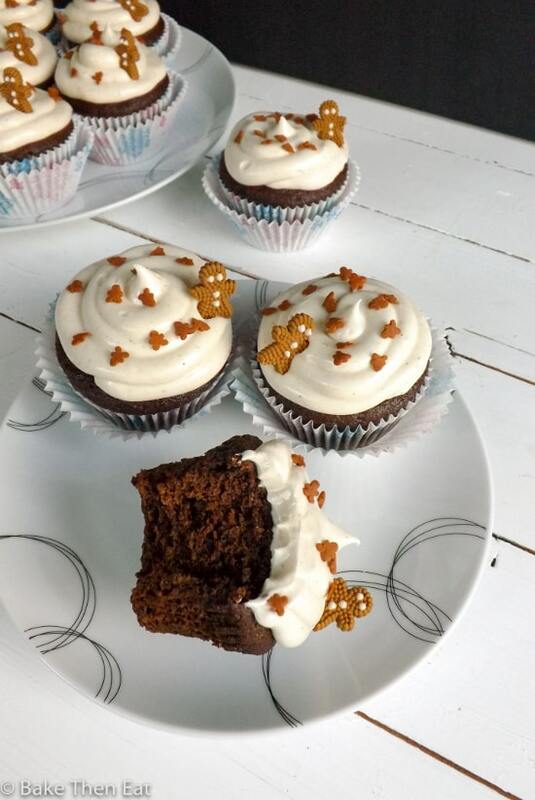 So if you can squeeze one more festive recipe in then give these gingerbread cupcakes with ginger cream cheese frosting a go. Believe me when I tell you they are quick and easy to put together, bursting with festive aromas and are deep and rich in flavour. The deep aromas and flavours come from the spices of ginger, nutmeg, all spice and cloves and the inclusion of dark molasses. I’ve added 160 grams (1/2 cup) of molasses, this may sound like a lot and you may be worried but trust me it is the perfect amount. It gives this gingerbread a dark rich flavour and one taste will convince you. Michael (Mr. Bake Then Eat) claims these are the best thing I have ever baked! It must be true because he has devoured them, and requested more. Which is unusual for him, he is more of a savoury guy, but he has found these hard to resist. 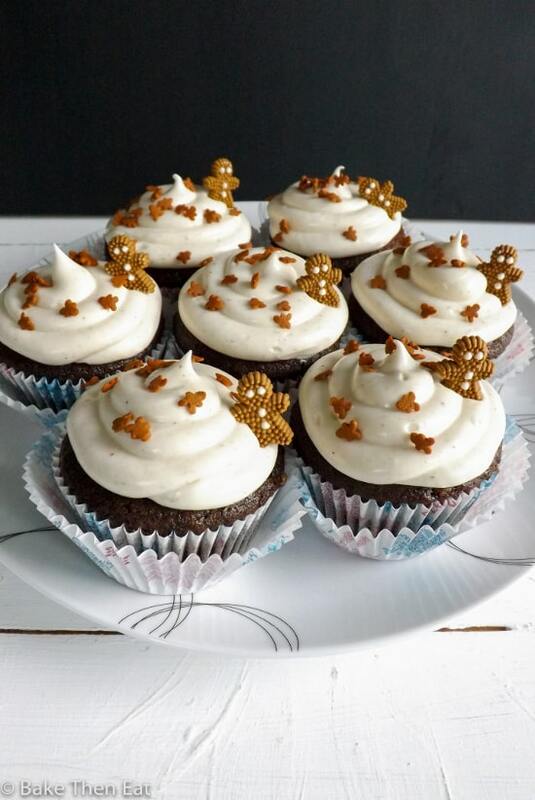 To frost these I have made a ginger cream cheese frosting. To flavour it I used 3 tablespoons of ginger syrup. I got my ginger syrup from a jar of stem ginger in syrup and I also added a teaspoon of ground ginger to boost the flavour even more. 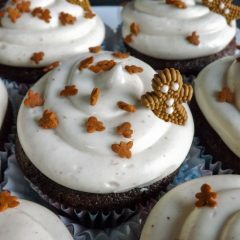 I hope you get a chance to make these gingerbread cupcakes with ginger cream cheese frosting because you won’t regret it. Cream cheese frosting can be a real nightmare sometimes for us Brits. The cream cheese in the UK has a lot more water in it then the cream cheese you can buy in the US. I have tried every brand in the UK and the same problem always arises, a runny gooey mess. I have had a few emails asking how I have gotten around this issue as I have featured cream cheese frosting in a few recipes. Well this is how I got around the water filled UK cream cheese frosting issue. An idea struck me a few years ago – take the water out! Well as much as I could. With each 240 gram pack I empty it into a piece of very fine muslin twist it all up and give it a good squeeze. You’ll be surprised how much water comes out of it. I usually manage to squeeze 10 to 15 grams of water out of it. By doing this every time I get a thick and creamy cream cheese frosting that doesn’t go all runny and gloopy. For more detail check out the the recipe instructions, below! 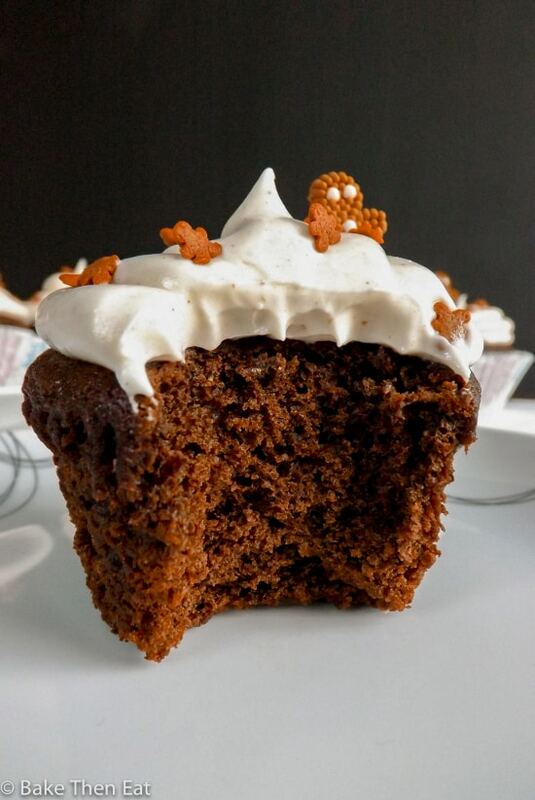 A dark rich gingerbread cupcake, flavoured with sweet spices and molasses. 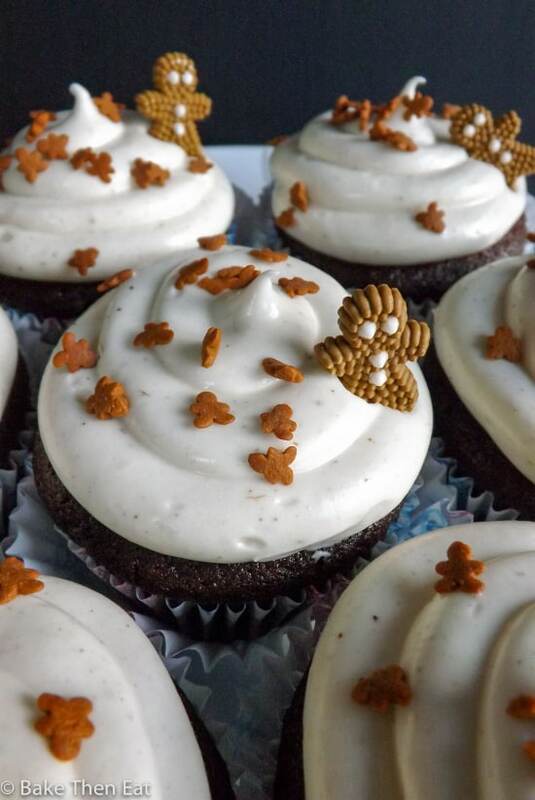 Topped with a ginger cream cheese frosting. Preheat your oven to 180C / 350F / Gas mark 4 and get a 12 hole muffin pan out and place liners in it. In a large mixing bowl place the flour, baking powder, baking soda and spices in together and mix until everything is well combined. In a medium sized saucepan put your molasses, butter and sugar in together and over a medium heat gently stir until the sugar has dissolved and the butter has melted. Be careful to not allow the mixture to boil. Once this is done take the mixture off the heat and allow it to cool down for a few minutes. Crack and lightly whisk your egg in a small bowl / cup and pour it into the bowl with the flour and spices in it. Then pour in you slightly cooled melted butter, sugar and molasses mix then pour in your milk. Gently mix until everything is combined. Be carful not to over mix your batter. I use an ice cream scoop to give my cupcakes a uniform size but if you don't have one fill up each cupcake case 2/3rds full and pop them in the oven for 18-20 minutes. Once a skewer comes out clean take them out of the oven but keep them in their pan for 5 minutes. Then take them out of the pan and place them on a wire rack to fully cool down. Add in the icing sugar and mix till very well combined. The icing will become very thick but this is fine. Add in the ginger syrup and the ground ginger and mix again. 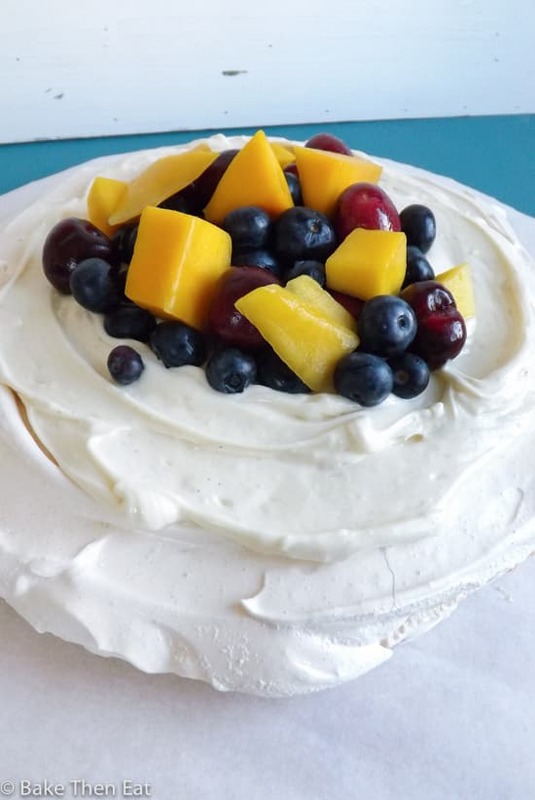 If you are using cream cheese bought in the UK it has a lot of water in it and it needs to be drained a little otherwise it will turn your frosting into a gloopy mess. I used a bit of very fine muslin, I placed my cream cheese in it tied it up and twisted it till no more water came out of it. My cream cheese, and I was using full fat Philadelphia lost 10 grams in weight once I had squeezed the water out of it. For some reason the cream cheese in the UK has a lot more water added to it then the American cream cheese and it is this excess water that will turn your frosting into gloop! Spoon, pipe, dip or spread the frosting on top of your cooled cupcakes. Decorate with sprinkles if you want. These cupcakes need to be kept in the fridge because of the cream cheese in the frosting. Bring them back up to room temperature before serving. These cupcakes will keep well in the fridge for up to 5 days. Oh I love these cupcakes! These would always be at the top of my list. These cupcakes look incredible and those gingerbread sprinkles are so adorable! 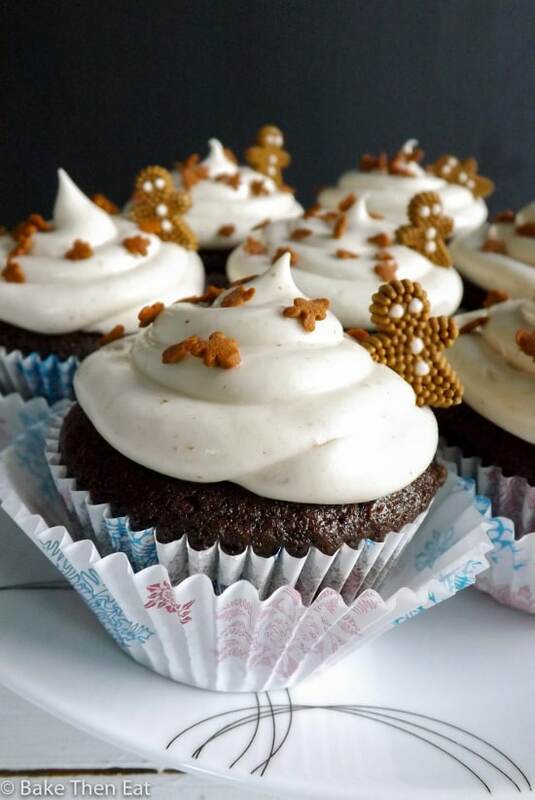 Love gingerbread anything and it sounds amazing with the ginger cream cheese frosting! Merry merry Christmas to you and your family, Emma! Hi Natalie, thank you glad you liked the tip 😀 Merry Christmas! So adorable and festive! I really love those X’mas sprinkles. Hi Angie thank you 😀 Merry Christmas! Hi Tiffany thank you so much 😀 Merry Christmas! It must be Christmas cupcake week…great minds think alike! 🙂 Where did you find those cute gingerbread sprinkles? 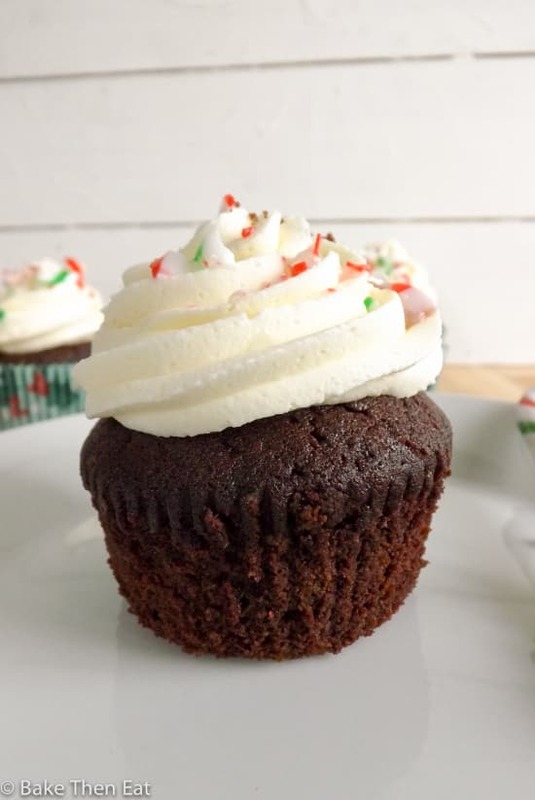 These cupcakes are perfect for Christmas, from the moist spice cake to the creamy ginger frosting. Delicious! Hope you and Mr. Bake Then Eat have a very Merry Christmas! !